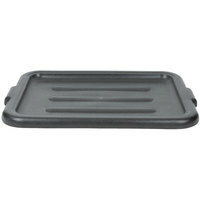 This black bus tub lid is made of heavy duty polyethylene. Its contoured lid design allows easy box-on-box stacking. These lids are strong and sturdy. They are easily washed in our dish machine. They fit the 20" x 15" bus tub perfectly. We use them for marinating meats overnight int he cooler. Kids are great. Easily washable and good material. We use it with the container. Stacks well in coolers and price is just great for anyone. Good priced lid. It fits the like bus tub perfectly. We like the option of colors on the lid so we can distinguish different product. We ordered several of these 20" x 15" plastic bus tub box lids to go with the bus tubs. We use them for storage as they are food grade, the lids make them stack nicely. The lids are perfect with the plastic bins. I use these to store items in the garage and the lids are a must to stack multiple bins. Very sturdy and a great price! I needed some to match some bins I already had. These were perfect and actually a better quality than what I had. Would purchase again. Typical black bus tub lid, super useful for all sorts of applications whether for food, dry storage, organization, dirty bin. I like getting them in black because they won't stain like the lighter colors will which give people the impression they are dirty even if they are cleaned well. Received this in a timely manner. Very sturdy and stays on bus tub securely. Lightweight and very durable. Just as we expected. Never disappointed by Webstaurant. Excellent product. But what can I even say about these lids? They defy expectations. They are sturdy enough to support being stacked upon and support the weight of a full one on top of it. Great strong lids. I'm actually able to stack these dish tubs on top of each other, when filled with cupcakes. I add ice packs to them and they stay insulated for hours. Note...they do not actually lock onto the tubs, only sit on them. Simple design, basic lid. Product doesnt snap on very tight, but does hold in place. Very economical along with the matching bus tubs. Great to have on hand for various uses. Ordered these along with the matching bin. The lid is heavy duty and seals onto the bins they go with very well. Very easy to clean and maintain. The lids are great because they turn the bins into stackable bins that are great for storage. I plan to use the lids to make storage bins to pack up supplies for my wedding, and then the day I will keep the lids off to the side so the bins can be used for bussing tables. These lids only fit on some of the 20x15x7 bus tubs we've ordered from Webstaurant. Maybe there was a slight change in the dimensions of the tubs and we just happened to get a mixed batch? The lids also warp easily with repeated use and exposure to hot water. I wish I could give more stars on this product--I will give the stars to webstaurant instead for their great customer service. I ordered a bunch of these to go with the bus bins that I ordered. Unfortunately only 1 or 2 out of the 6 I ordered were straight enough to sit properly on the bus bins. The others were all warped and so they sat all crooked and wobbly on top of the bus bins. They do not snap on or clamp down at all so they need to be straight in order to sit properly. I contacted webstaurant and they immediately sent out all new replacements--but those too were almost all warped. By that time I just didn't have the heart to call them back and complain again. So I now have a couple lids that will work and a whole lot of wobbly lids that I am hoping will straighten out over time of stacking stuff on top of them. Thanks for trying webstaurant! The lid does not lock but this may be a positive thing depending on how you use it. The bottom does not extrude much (less than half an inch). This is important so you know how much space you need to leave on the top so the lid can close. Having these lids makes the buckets a lot better you’re able to stack and use very little space I would recommend these for all kinds of restaurants . If you have a bus tub that doesn't have a companion lid, this lid is the perfect solution. We use these lids when using bus tubs at mobile events as our three compartment sink. Great lid. We use a few of the bus tubs for marinating chicken or pork. The lids are sturdy enough, we have never stacked more than three mainly because fo the room. I bet you could stack more. Reliable and they do not wear easily. This lid fits nicely on the bus tubs but does not make an air tight seal. Easy to wipe clean. Stackable. Worth buying the lid with the tub for the stacking purpose alone. The lid works well with the matching tub.Good price and pretty thick.Wish it locked down.After two years the top is warping a bit.Would purchase again. We use bus tubs to brine our chicken and to store our seasoned meats before smoking. Having these bus tub lids makes it nice to stack items and to help keep our coolers organized. These bus box lids fit perfectly onto the bus tub. They can be used for a number of things. We have quite a few on hand as you can never really have enough of these. just purchased this item about a month ago, and though i was expecting to find that the lid clipped into the box tub, i can say that i am fully satisfied with the purchase. These are sturdy and shiny and if you have a couple of them you won't have a problem stacking 2-3 full bus tubs on top of one another. These are cheaper than any supply store i've found. We use these with the bus tub to keep our bread in for our paninis after we slice it. Not airtight but seals enough to keep the bread fresh until we use it. If you have the coordinating tubs you'll find these lids very useful. The fit is great and they make stacking several tubs (even when full of dishes) easy and stable. Great price for a useful accessory. Lids arrived a little bent out of shape and didn't sit quite right on their tubs. But I put the lids each on a tub and stacked them all up, and the weight of the higher tubs straightened them right out. Very happy with them now! I have a bout 30 of these to go with my black bus tubs. There's a coating on the inside that is slowly peeling off some of them that I try to scrub off when I can. Also note: these only sit on the bus tub, they don't latch to it. It is very sturdy, but it does not fit right on the tub. The quality is excellent! I wish that it fits better on the tub. Bus tub lid that allows you to stack multiple bus tubs on top of each other if needed. Made from the same material as the bus tub it goes with so you'll have a good quality product. fits well. does not warp and melt in the dishwasher. fits any bus bucket we have in our kitchen. no reason to buy any other. Good tub, stacks nicely on top of another or other things with lids however the lids don't snap into place they just rest on top of the bin. this is a must have for your bus tub. it's nice so you can keep a cover on your small dishes like plates and cups until you can get into the kitchen. These babies arrived sooner than expected and are the perfect fit for the bus tubs I ordered from the Webstaurantstore. I tested them to see how well they fit and I was pleased. It does not take a major effort to come off however, they definitely stay on until you want to remove them. Excellent! This is product is very sturdy. It was very easy to wash. The quality is very well for the price. I definitely will buy them again and recommend it as well. These are very nice and sturdy lids. They fit perfectly on top of my bus tubs. The lids allow me to put food in the bus tubs and stack them in the cooler. These lids keep the dust out, but they do not create an airtight seal. They work well for making the bus tubs stackable for storage. This lid fit nicely on the tub and made it so we could transport things inside without fear of spilling. A sturdy lid that also allowed us to stack things on top. This is the top for the bus tub box also purchased from Webstaurantstore.com. it's not airtight but it keeps things covered so you can stack the bins with ease. Great price. Wish the material was better quality. The seal between the bus tub lid and bus box is not great and water will leak. This poly plastic tub lid is a great addition to the poly bus tubs. It's easy to use and fits securely on the tub. Great buy. Great quality bus tub lid. Fits perfectly on the 20" x 15" x 7" tubs we purchased. The lids makes the tubs able to stack, which is a great space saver. Perfect fit for the bus tub box. We stack a lot of weight on top of theses and haven't had one crack or even seem to give. Very strong. Great stacking lid. I plan to use with tubs for dish storage and odds and ends. It arrived a little lop sided but after I put it on the tub, all is well. A perfect companion for your bus tubs. Perfect for hiding your dishes or protecting your dough. Allows me to stack bus tubs like there is no tomorrow. Fits perfect with the 20" x 15" x 7" bus bucket. These buckets aren't only for bus tub use. They make great storage buckets of dry goods, flour, lettuce and place in the walk in cooler. All sorts of uses! Great price! Not really what i was expecting. Was kind of hoping for the lids to snap on to the bus tubs. Other than that it is very durable plastic. I won't hesitate to buy more. Thank you WEBstaurant store for the priceand quality of the item. Ill definitely recommend. We love how super durable these lids are, and that they fit on multiple sized busser bins. They hold up under weight too, and these will let you stack bins to store items as needed. Awesome lid, that allows you to keep your prepped foods and ingredients fresh and away from flies in outdoor catering situations. And the fit is tight! These lids are very durable and will last a long time. They sit nicely on the tubs but are not air tight. Great for stacking. These fit the accompanying "Black polyethylene plastic bus tub." Out of the box, they fit well and snap closed (note -- the lids do not form an air-tight seal). We use the tubs for large quantities of coleslaw, mac salad, etc. We go through a lot of lids -- some of them (and I stress SOME, but not ALL for some reason) warp when thy get warm (of course not in a dry heat -- our dishwasher does the trick). They are good, but I wish they held their shape better than they do and stood up to commercial dishwashing! Lids are very sturdy and the proper size for the bins. They do ship as little bent and distorted, so it took a little time for it to fit nice and clean on the bin, but they work themselves out over time. Good product overall. Not much else to say than it fits perfectly on the bus tub and allows you to stack them. Cover is of good thickness, I was expecting a super thin one for the price! This is a very tough lid. It fits the tub like a glove. I can stack five tubs easily and not overload the lids. Great value and addition to the tubs. Love these lids. They fit both our 5" and 7" deep Bus Tubs and make them more versatile. They are very durable and always look good, even after a year of use. Not that there is anything really special about these lids; they do what they're supposed to do. But they seem pretty sturdy and they're far cheaper than you'll find at your local restaurant supply store. Good buy. Good product. Just as sturdy as the bin it goes with; I can fill multiple bins with heavy equipmnt and stack them without worry of the bins deforming or warping. Very sturdy lids. Can handle stacking and clean up very easily. I ordered more of these when I say how handy they were! Helps for storage of fresh fruits and veggies too! The lid is a good match for the basic bin I bought. It is quite a loose fit as noted in another review. Not really a flaw, just something to be aware of. Good if you don't need an air-tight seal, but I'd like a snap on option. These lids make a great companion to the black bus tubs that I purchased to grow hydroponic produce in. I have been very happy with their strength, even after I drilled 8 holes in each one for the plants to sit in. The amount of weight that I am putting on the lids is decent considering the plant materials, hydroton pebbles, and growing medium, and the lids don't sag one bit. While this is certainly not the most traditional use of bus tubs and lids, this setup works great for me. Great tubs and lids to store mozz cheese in or anything else you need to carry around. Any pizzeria should have plenty of these on hand at any given time. This Polyethylene Plastic Bus Tub Lid fit well with my bus box tub. It is very sturdy and does not come off the bus box tub. It is easy to clean. Great price. Well, these covers don't snap lock in any way, shape or form. So I was a bit disappointed in these covers. So they didn't quite do the job. I purchased these based on what is shown online as "usually goes with" or whatever it says. Disappointed. Great lids to use with the bus pans that are sold here also. We use them so that we are able to stack the pans. Matching lid for bus tub. Very sturdy just as the bus tub is. Very low price. They are designed so you can stack the lidded bus tubs. These plastic bus tub lids are a great way to multi task the bus tub. We use ours to ferment bread which provide a nice humid environment. These lids and the bus tubs are a great, economical way to store food. They are affordable, easy to clean, easy to handle, & easy to store. When empty, they stack easily to save space. A great value for the commercial kitchen! We fill these with 25 pound plus and they carry and stack well and hold up Price is great too. Easy to clean and refridgerate. These durable lids are the perfect match to the bus boxes we purchased. They fit beautifully, wash easily, are quite durable and keep their shape. We paired these up with the bus tubs to make stacking a breeze in our cooler, freeing up some much needed space. Great value! We will be back for more! Not a big fan of this particular tub. The quality seems to suffer a bit and it bends easily. I have a food truck, and this item couldn't survive, unfortunately. These work really well. They are great for places that use bus tubs to store fresh produce or lettuce. you can very easily stack multiple buckets on top of eachother too. We store a lot of produce in bus tubs and these lids make it very easy to stack tubs on top of each other. They're sturdy and hold up to the very heavy loads above them - even when stacked many high. We purchase these lids to use with the 15x20 tub. With the lids, the tubs are great for storing all sorts of same catering items and makes the tubs easy to stack. Perfect cover for the tubs also purchased here, I love how you can buy exactly what you need with all accessories here. I was purchasing these locally at a higher price. This cover is great for bread fermentation. It stays on very well with little effort to get it off. The cover also protects food items from foreign objects. The bus box lids are a perfect fit. We love being able to stack our bus boxes for travel and storage. It is also good when using the boxes for food prep. I recently bought the 15x20 bus tub lid to go with my bus tubs. The covers fit great but I wish they were more air tight and leak proof. This lid is perfect for allowing you to stack multiple bins on top of each other for better use of space! Great for stacking bins of fruits or vegetables!! This lid fits the companion bus box very nicely and keeps contents of the box fresh. Lid also allows boxes to be stacked, thus saving space on our shelves. This bus tub lid does, indeed, fit the intended bus tub. It is strong and sturdy as expected of a utilitarian bus box lid. A little bit of locking action might be helpful, but you can't beat this product for the price.